Mowing the lawn – it’s an integral part of homeownership. It’s also been a challenge for decades at this point. Any number of different tools have been developed to help make lawn care simpler, easier, less time consuming and less invasive. One of the more popular options today is an electric lawn mower. They’re almost completely silent, create no noxious emissions, and come in both battery and corded varieties to suit your needs. Whether you’re interested in going green with your lawn care or just don’t want to bother your next door neighbors, an electric lawn more can be an excellent choice. However, given the wide range of types, configurations, sizes, and capabilities on the market, it can be pretty difficult to determine which is the best option for your needs, budget and yard. Below, we’ll compare the 10 best electric lawn mowers on the market, and then dig into each with a more in-depth review. Finally, we’ll wrap it all up with an in-depth buying guide to help ensure you get the perfect solution for your yard maintenance needs. As you can see, there are quite a few electric lawn mowers available, and they all offer something slightly different. Of course, making an informed decision here will require knowing a bit more about what you can expect from each mower on our list. Below, we’ll run through a more in-depth review of each model to help you make a smart choice. 12 Should You Give Up Gas? Our top-rated electric lawn mower, the Greenworks 20 amp corded lawn mower offers plenty of power and capabilities – so much so that you might forget there’s no gasoline engine on board. It delivers a 20-inch cut with a solid steel deck, but don’t let that make you think this mower is heavy. It’s light enough that you can cut your entire yard without feeling the strain. Of course, because it’s electric, there’s no need for oil, gas, pull strings or other frustrations. You’ll find seven different height adjustments so you can get the perfect cut every time. The front wheels are seven inches, and the rear measure 10 inches, ensuring that you can easily traverse even uneven yards. The included bag is ideal for capturing clippings, and the mower automatically mulches. Or, you can remove the bag and discharge clippings from the side. The motor produces a powerful 12 amps to ensure reliable performance even with thicker lawns, and the handle folds for simple storage. The only potential drawback with this mower is that it does not include an extension cord. The cord attached to the mower measures just a few feet – you’ll need to purchase a cord rated for 12 amps to use the mower. The second item on our list, and the first from Sun Joe, is the MJ401E Mow Joe. It offers a 14 inch deck and a 14-inch cutting blade. However, the deck is made from plastic, unlike the Greenworks model we mentioned above, which is made from steel. While the Sun Joe deck is lighter, it is also less durable and more susceptible to damage from things like rocks or sticks being mowed over. 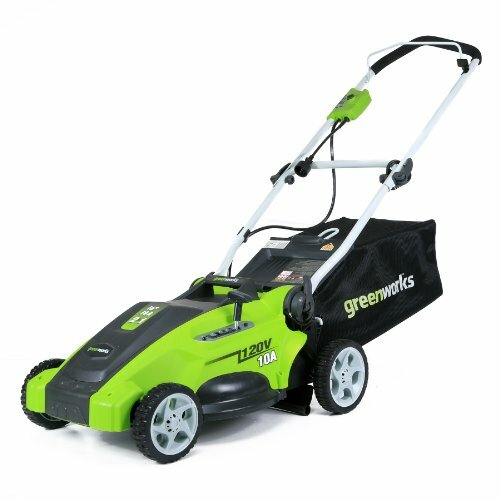 Like the Greenworks, the Mow Joe offers 12 amps of electric performance, and a maximum blade rotation speed of 3500 RPM. 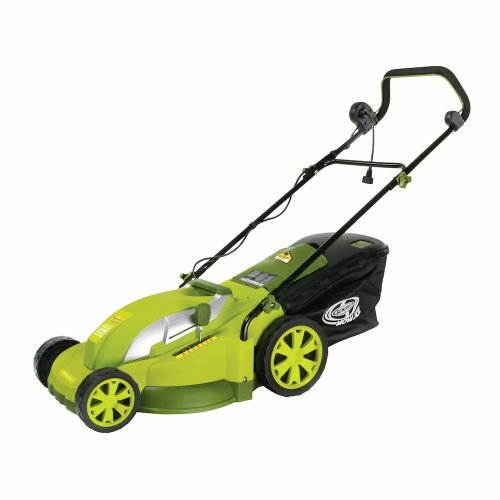 This mower only offers three different height positions, though, in comparison to the Greenworks’ seven positions. It can reach a maximum height of 2.25 inches, and is designed for use with yards up to about .25 acres in size. The mower does come with a detachable clipping bag. Note that the manufacturer states not to use this mower with an extension cord longer than 100 feet, or less than 14 gauge. Like other models on our list, this one does not come with an extension cord. One of the more interesting items to make our list, the Black+Decker MTE912 is a three-in-one tool that combines an edger, a mower and a trimmer. However, it’s not quite the same as either of the two options we touched on previously in terms of mowing capabilities. Unlike any other electric lawn mower on our list, this one does not use a blade. Rather, it uses trimmer string – the same string that the edger and the weed trimmer use. There are a few other considerations here, as well. One of those is that the cut path is just 12 inches, meaning that it’s really better suited for cutting very small yards. In fact, the manufacturer recommends it for cutting areas of 750 square feet and under. 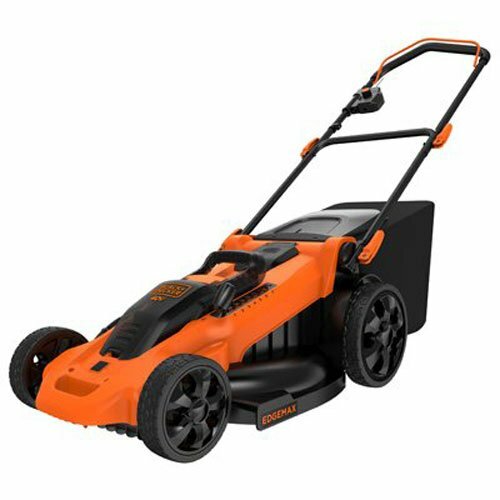 The motor puts out 6.5 amps, which is more than ample to power the trimmer, edger and mower portions, as long as you are not trying to plow through thick, heavy growth. The mower does come with an automatic feed system that ensures your cutting string is always at the perfect length without any need to bump the head or stop to pull out more. Note that this unit does not come with an extension cord. The second Greenworks mower to hit our list, this one offers some important advantages over those that have come before. Perhaps the most significant is the fact that this one does not need to be tethered to a power outlet – it uses batteries. It ships with two 40-volt batteries plus the battery charger, and each battery is supposed to offer up to 60 minutes of use time. However, understand that this is a vague estimate. The actual battery life will depend on the thickness of the grass being cut. The harder the mower must work to cut grass, the faster the battery will deplete. This mower offers a nice 20-inch cut path with dual steel blades, although the deck is made from plastic. It also offers seven inch front wheels and 10 inch rear wheels, as well as a bagger with a convenient carry handle built into it. Perhaps the most innovative feature available with this mower is the power adjust system, or Innovative Smart Cut technology. It automatically adjusts the power output to match the thickness of the grass. This mower is rather hefty, though, and weighs in at 42.5 pounds, which is more than a little heavier than some of the other options available. 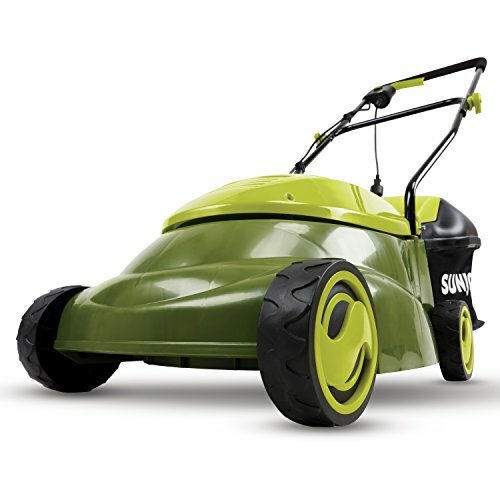 Looking for a svelte little electric lawn mower that nevertheless offers decent performance and a wide-enough cut path? 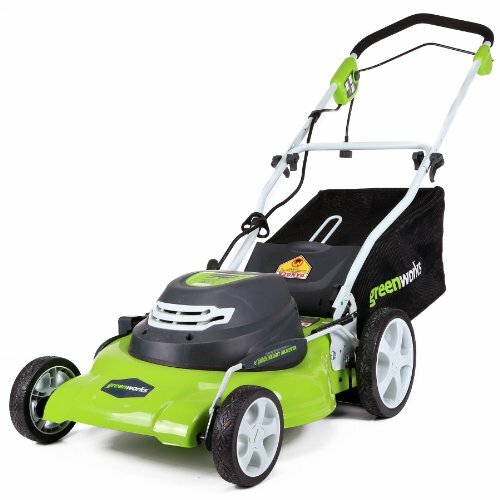 Enter the Greenworks 16-inch 10 amp corded lawn more. It offers a full 16-inch cut with a steel blade, and it also features a steel mowing deck for better durability. You can adjust the height of the deck with five different presets, helping you to get the perfect height for your specific yard, as well. Note that the front wheels are 6 inches and rear wheels are 7 inches, which may make it more challenging to push over uneven terrain. With that being said, this mower does offer side discharging and mulching capabilities. However, it does not come with an extension cord. With an 16-inch cut path, it is better suited to smaller lawns, as well. Note that this mower comes with a full four-year warranty, which is one of the best in the industry. It does weigh in at 37.5 pounds, though, due to the steel mower deck, so it may be heavier than many people expect from an electric model. Sleek, streamlined and offering an aggressive stance, the Sun Joe iON 16LM 40V 16-inch cordless lawn mower is an excellent option for anyone looking to enjoy the benefits of an electric lawn mower without having to be tethered to a power outlet. This mower offers a plastic cutting deck to lessen the weight, and the powerful brushless motor offers outstanding performance. The batteries only offer 40 minutes of cutting per charge (in comparison to the 60 offered by the Greenworks Twin Force we reviewed previously. If you prefer, you can also plug this mower into a power outlet and use it that way (extension cord not included). However, it does come with a clipping back with a built in handle, and it offers six different height adjustments to help you find the perfect cut for your lawn. Note that this mower is also EnergyStar certified for power savings and the handles do fold for easier storage. The motor offers an estimated 2,000 hours of use life with proper care and maintenance. Finally, this electric lawn more is covered by a full two-year warranty. 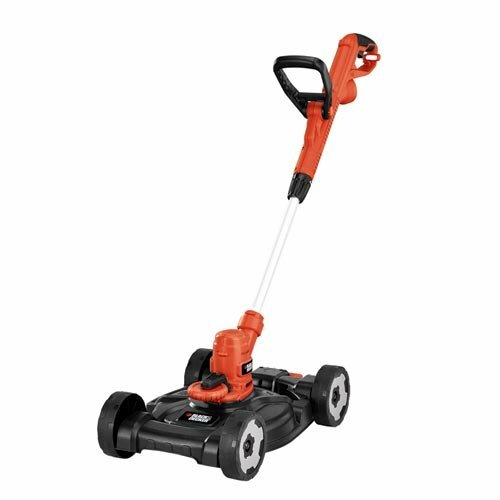 Beefier than the Sun Joe we just reviewed, the Black+Decker MM2000 13 amp corded mower delivers a 20-inch cut path that’s ideal for medium sized yards. It also comes with plenty of other extras that might tip the scales in its favor, such as the included clipping bag and mulching capabilities. The mower offers seven different height adjustments so you can dial in your cut height perfectly, and the 13 amp motor is strong enough to handle even thick grass. The innovative deck design also allows you to get right up close to fences, flowerbed borders and other obstacles to reduce the need for edging with another tool. Like several other models on our list, this lawn mower also folds up for easy storage when it is not in use. Note that this electric lawn mower does not come with an extension cord, and Black+Decker recommends using no longer than 100-foot, 14-gauge cords to ensure safety and performance. 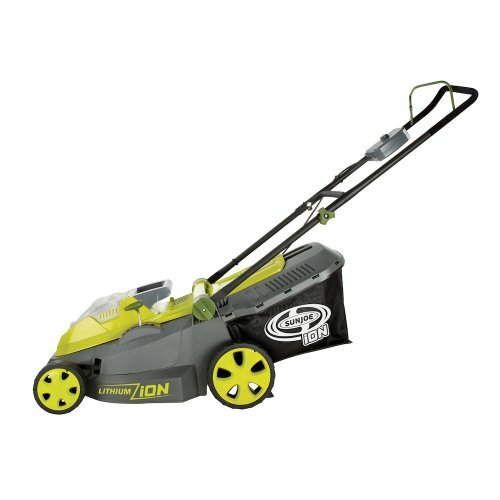 Looking for a smaller electric mower to handle your yard trimming needs? The Sun Joe MJ403E Mow Joe might be the answer. 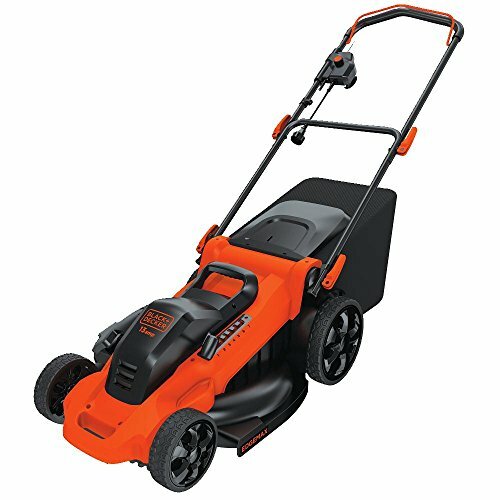 It offers a 17-inch cutting path with a 13 amp motor, which is strong enough to handle even thicker grass growth. This mower also delivers mulching capabilities, and comes with a clipping bag. The bag can hold up to 12 gallons of clippings. Unlike a handful of other options on our list, this one offers seven different cutting heights to tailor your mowing (.98 inches all the way up to 2.87 inches tall), and it comes with a full two-year warranty, as well. Note that this mower does not come with an extension cord, and you should not use a cord over 100 feet, or less than 14 gauge. The single cutting blade is made from high-quality steel for durability and improved performance; however, the cutting deck is made from plastic. It weighs in at 31.5 pounds, making it a middle weight option. 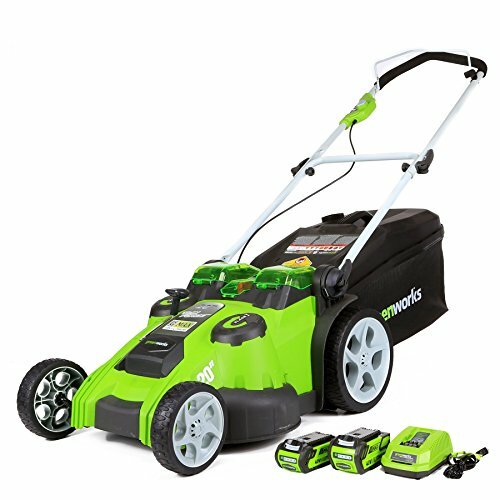 For those interested in an electric lawn mower not from Black+Decker, Greenworks or Sun Joe, there is the Worx WG779. It’s an aggressively styled electric mower that offers some interesting benefits, not least of which is the fact that it is powered by two 20-volt batteries. You can adjust the height of the cutting deck with a single lever – there are only three presets, though, meaning you are a little more limited with this one in terms of dialing everything in. You’ll also find that you can cut up to 5,000 square feet on a single charge. That translates to a 50 x 100 foot section of lawn. It also features IntelliCut® technology that automatically adjusts the power output of the mower based on use needs to help extend your battery life. However, this mower only offers a 14-inch cut path, meaning that it is better suited for smaller yards. It does fold up compactly for easy storage when not being used. This mower includes a dual port charger with indicators that tell you battery charge at a glance. The final electric lawn mower on our list is the Black+Decker CM2040 40V lithium 3-in-one mower. It offers a 20-inch cutting path, which is one of the larger ones on our list. 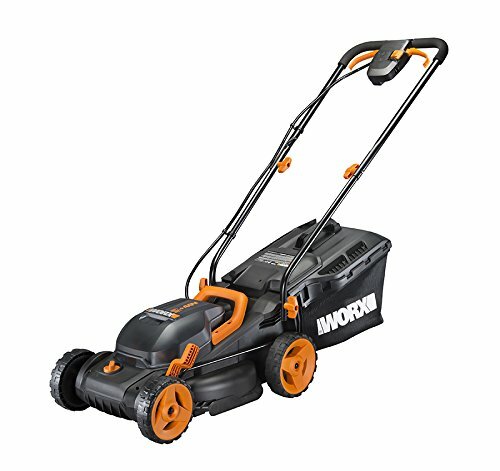 The batteries last a decent amount of time, and the mower also offers the EDGEMAX design to limit the amount of extra edging you need to do with a trimmer. The mower comes with a 15-gallon clipping bag, and can mulch as well. It also offers six different height options that can be selected quite easily (from 1.5 to 4 inches). The motor features intelligent sensing technology that reduces blade speed when full power is not needed to help spare battery life. Note that this mower does not allow the use of an extension cord – battery power is the only option. This mower also weighs in at 55 pounds, which is one of the heaviest on our list, and may be difficult for some users to push. As you can see, there’s a lot to love about the electric lawn mower selection available. There is definitely something for everyone regardless of budget or lawn size. However, if you have never used an electric mower before, there are quite a few things that you’ll want to know about choosing the right model. Our buyer’s guide will walk you through everything you need to understand. Electric lawn mowers offer a number of important advantages. They do not need gas or oil. They don’t emit exhaust fumes. They create virtually no sound during operation. However, they also have some important drawbacks to understand – corded models require a constant connection to a power outlet, and you cannot exceed manufacturer recommendations for extension cord length of gauge (thickness). Battery powered models let you cut the cord, but they require recharge time. You’ll also find that most electrics are more expensive than their gas-powered counterparts, and none of them offer the same cutting power (many do come very close, though). If you have never operated an electric lawn mower, or are unsure about how to choose the right model for your needs, we’ll explore the most important topics to understand. Should You Give Up Gas? Before we do anything else, we need to discuss whether or not you should even bother with electric lawn mowers. Many of models on the market are not worth your time or money. Our list comprises some of the better choices out there, and all are worth considering, but those not found on our list are probably better avoided. There’s also the potential that you may have a yard that is just too big for an electric mower. Most of the corded models on our list max out at around a half acre, and some can only work with a quarter acre. Battery powered mowers are more difficult to gauge, because battery life has more to do with the thickness of the grass than how many square feet of yard you have to cut. In short, make sure that your yard is sized correctly for an electric lawn mower. Also, if you decide that a corded model is for you, make sure you have ample outlets available to you. There’s nothing worse than getting halfway through your cut only to realize that you only have a single exterior outlet and you cannot reach the rest of your yard. Think long and hard before you upgrade to an electric lawn mower. They’re not for everyone. If you’re not an electrician, or have no background in electricity, then you may not understand the importance of a mower’s amperage rating. Think of it as being similar to horsepower – it’s a term that denotes strength and power. The higher the amperage, the stronger the mower will be. However, that also means it will pull more current from the outlet or deplete the charge on a battery that much more quickly. So, if you have a larger yard, or you have thicker grass, then a higher amp model will be better for your needs. Like gas engine mowers, electric lawn mowers have specific cutting path widths. These are noted in inches (16, 17, 20, etc.). The wider the cutting path, the fewer passes you will need to make to cut your yard. However, if you have a smaller area that needs trimming, a larger lawn mower might be too wide. The general rule of thumb here is to choose a model that fits your space, but allows you to make as few passes as possible. Gas-powered and electric lawn mowers allow you to adjust the height of the cut. This allows you to trim your yard to the height best suited for the type of grass you have, but also for your personal sense of aesthetics. As you could see from our reviews, many electric mowers offers multiple height adjustments, but some offered only a few. Perhaps the most important consideration here is to know how tall you prefer to keep your grass, and then to choose a mower that allows you to maintain that height. However, you may have more complex needs. For example, if you are seeding grass in an area, you will want a mower that can be adjusted very high to take care of upstart weeds without mowing down grass seedlings while they get established. Once they are growing healthy and strong, you can adjust the mower deck down to the height that you prefer. You may also have different height preferences for your front and rear yards. Choose a model that allows you to easily maintain your grass at the height(s) you want with a minimum of fuss, but also allows you to handle additional needs like reseeding. With a gas-powered lawn mower, you may have limited storage capability – some push mowers do offer folding handles, but that’s a rarity. Many of the models we’ve reviewed allow you to fold the handles and store your mower out of the way. Even a 20-inch model can become quite compact, and can be fit on a larger shelving unit to make the most of your floor space. If you’re considering one of the battery-powered models on our list, you should careful consider the battery life. As mentioned previously, battery life is difficult to estimate, because the thickness of your grass and how hard the motor must work to turn the blade determines more about charge life than square footage of yard. As a rule, 40V systems offer the best runtime, but larger yards may require the use of two batteries (or one battery charged two times). Be aware that some batteries can take one or more hours to fully charge, meaning that your lawn care could be spread out a bit more than you would prefer. Corded electric lawn mowers don’t have the same issues as battery-powered mowers, but they are not without their own concerns. The most obvious is the cord. You have to stay connected to your home’s electrical system at all times, or the mower doesn’t work. This may not be an issue for those with small yards, or minimal trimming needs, but for homeowners with larger amounts of space, it means having to buy longer and longer extension cords (none of the models we reviewed come with an extension cord, meaning that your costs will be higher than you might have anticipated). Mulching Capabilities: Not all electric lawn mowers can mulch grass clippings, but this feature allows you to convert yard waste into rich compost that can be applied to flowerbeds or even vegetables, reducing your costs and increasing your yield. Bagging: Again, not all electric mowers come with a clipping bag, but this is a nice feature to have if you don’t want to spread your yard waste back over your grass. It’s also important in situations where you might have very tall, thick waste that would kill the grass if you left it lying there. Bags are measured in gallons, so the higher the capacity, the more waste it will hold. Look for bags that offer features that make them easier to use, such as handles. Auto Power Adjust: This feature is primarily found on battery-powered electric lawn mowers, and it is designed to adjust motor performance based on demand in order to extend battery life. In conclusion, electric lawn mowers may be a good fit for your needs. You’ll need to carefully consider your yard’s size, and determine whether you should stick with gas or go with a corded or battery powered model, though. Then, simply choose the model that offers the right mix of cut width and features to meet your needs and requirements. Be aware that battery-powered models are improving all the time, as are corded lawn mowers. Those available on the market today are a far cry from the options you had available to you even just a few years ago. While they might not be quite as versatile as gas-powered mowers, electric lawn mowers are now viable choices for more homeowners than ever before.